Added toolbar icons for 'Directory Level Up', 'Go To Root Directory', and 'Copy Selected Files To'. Added new information to 'Attributes' column: 'I' for 'Not Content Indexed', 'E' for encrypted file, 'X' for 'No Scrub File', and 'V' for 'Integrity Attribute'. Fixed the copy feature to copy the date/time of folders and attribute of files. Fixed issue: On some systems, ShadowCopyView displayed 'error 0x00000001' message if there is no any shadow copy on the system. 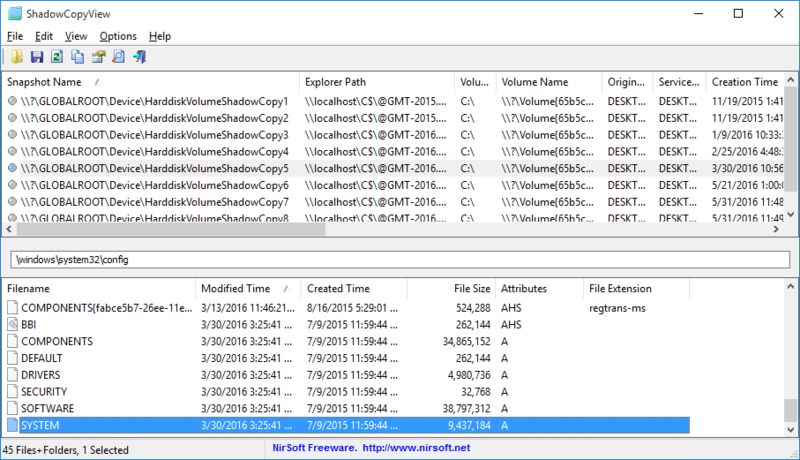 ShadowCopyView is also available in other languages. In order to change the language of ShadowCopyView, download the appropriate language zip file, extract the 'shadowcopyview_lng.ini', and put it in the same folder that you Installed ShadowCopyView utility.